To get most out of your MySQL database, it is important to understand how to connect from your custom PHP program to MySQL database. This tutorial explains the following three methods along with appropriate example PHP program, which will explain how to connect from your PHP to MySQL database. For this, you should install php-mysql package. On RedHat based distro including CentOS, use yum to install php-mysql as shown below. Note: Everything that is explained here will also work with MariaDB, as it is same as MySQL. 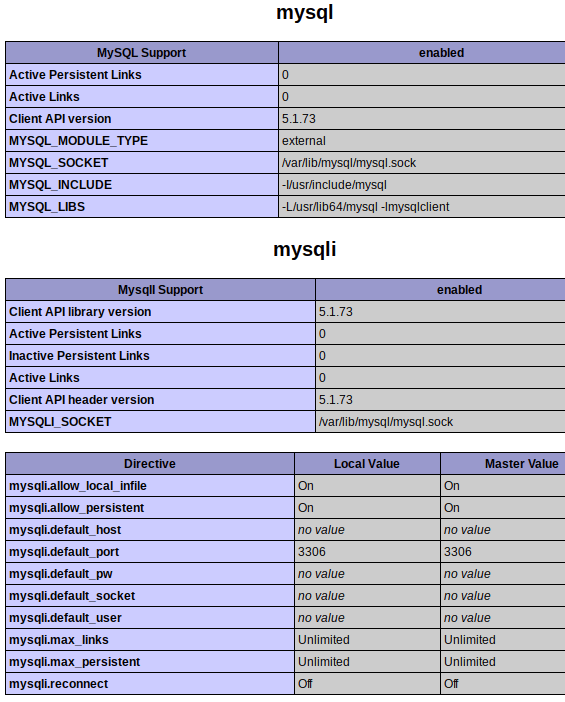 mysqli stands for MySQL Improved. Please note that on most distros (for example: CentOS), php-mysqli is already part of the php-mysql package. So, you don’t have to search and look for the php-mysqli package. All you have to do is install the php-mysql package to get the mysqli extension working on your system. query function – Use this to specify your MySQL query. In this example, we are selecting the name column from employee database. Finally, we are displaying the number of rows selected using the num_rows variable in the result. We are also closing both the result and connection variable as shown above. When you call the above mysqli.php from your browser, you’ll see the following output, which indicates that PHP was able to connect to the MySQL database and fetch data. PDO stands for PHP Data Objects. PDO_MYSQL drive implements the PDO interface provided by PHP to connect from your PHP program to MySQL database. On most Linux distros (for example: CentOS and RedHat), php-pdo package is already part of the php-mysql package. So, you don’t have to search and look for the php-pdo package. All you have to do is install the php-mysql package to get the PDO_MYSQL PHP extension working on your system. mysql connect string: This will be in the format of “mysql:host=$hostname;dbname=$dbname”. In the above example, the db is running on localhost and we are connecting to thegeekstuff database. $sql variable – Create the sql query that you want to execute. In this example, we are selecting name column from employee table. query($sql) – Here we are executing the sql query that we just created. foreach – Here, we are looping through the output from the above query command and storing it in the $row variable, and then we are displaying it using print command. In MySQL PDO, to close the connection, simply set the $conn variable to null value. Use this method only if you are using an older version of PHP and cannot upgrade it to the new version for some reason. It is recommended that you use the Method#2 and Method#3 shown above instead of this method. I’ve included this method only for reference, and not as a recommendation to use. This particular extension was deprecated as of PHP 5.5 version. But starting from PHP 7.0 version, this will not even work, as it was removed. Starting from PHP 5.5 version, when you use these functions, it will generate E_DEPRECATED error. mysql_connect function takes three argument: 1) hostname where the MySQL database is running 2) MySQL username to connect 3) Password for the mysql user. Here it is connecting to the MySQL database that is running on the local server using username root and its password. mysql_select_db function – As the name suggests, this will pick the database that you want to connect to. This is equivalent to the “use” command. In this example, we are connecting to the database thegeekstuff. mysql_query function – Use this to specify your MySQL query. In this example, we are selecting the name column from employee database. mysql_fetch_row – Use this function to fetch the rows from the SQL query that we just created. Finally close the connection using mysql_close command as shown above. When you call the above mysql-legacy.php from your browser, you’ll see the following output, which indicates that PHP was able to connect to the MySQL database and fetch data. Thanks …. But what are the Pro’s and Con’s of using the different methods? You should rewrite the article taking into consideration that the deprecated dangerous MySQL interface was deleted in PHP7.0.0. Pro: MySQL native driver so the connection process would be more faster than any other method. Cons: Only valid for MySQL if you want to migrate to another DB engine like sqlite or Postgre you must rewrite your code. Pro: You can easily migrate from one DB engine to another one, for example from MySQL -> Postgre due you are using PDO (PHP Database Object a DB access abstraction layer). Cons: I think the performance is not a real issue due today we have wide band between servers also the process to convert from a standard method connections/query to specific one has no serious impact on app performance.